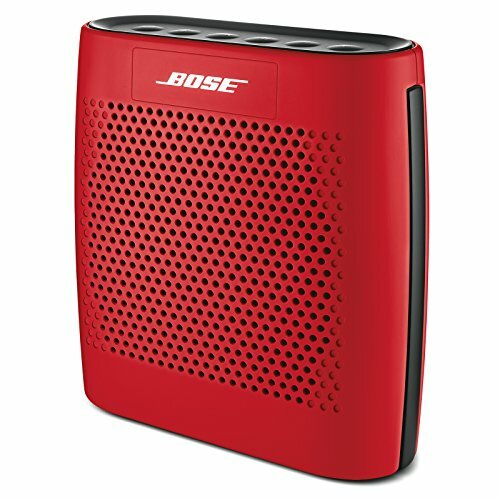 The Bose SoundLink Color was one purchase that I didn't want to make, but I'm happy that I made it. My wife really wanted a Bluetooth speaker. She wanted to listen to music in the kitchen, in the bathroom, on picnics, everywhere she could. I didn't want to spend money on something that I knew was a pure luxury purchase. I especially didn't want to spend over $100 on a little speaker. Well, knowing that speaker purchases tend to be highly subjective, we went to the local big box electronics store to try out as many Bluetooth speakers as we could. I wanted to listen to all of them and pick the one that sounded the best. This took a long time. So long that I became a little embarrassed about all the hemming and hawing we were doing. I recommend you do the same. Don't purchase this speaker after reading my review. Make a decision for yourself about which speaker is best for you. So the first thing we did at the big box electronics store was listen to all the different speakers in their demo mode. This was a little helpful in that it helped us eliminate some speakers right from the get-go. If a speaker doesn't sound good in demo mode, a mode where the speaker manufacturer is able to chose a song that makes their speaker sound its best, then it definitely wouldn't sound any good in daily use. Next, we chose a single song on my wife's phone and went through the arduous process of figuring out how to pair her phone with each speaker and play that song. This way we were able to do an apples-to-apples comparison. The same exact song was played on each speaker, so we could pick which speaker we thought played the song best. By doing this, we narrowed our selection down to two choices: the Bose SoundLink Color and another speaker that was less than half as expensive. The Bose sounded way better than all the other speakers, but it was also in a league of its own in terms of price. We were effectively choosing between the best cheap speaker and the Bose. Eventually, we played a podcast from my phone on the last two contenders, the Bose and the best cheap alternative. The speech was much clearer on the Bose. That wasn't really a surprise. We ended up going with the Bose. I wasn't happy with the price difference, but the difference in sound quality was very clear. I knew I wouldn't be happy listening to the comparatively low-quality sound that the cheaper speaker produced, so I convinced myself that the higher price of the Bose was worth it. We've had this speaker for at least a year now. It works fine except sometimes the charger plug/unplug noise gets a little out of sync with the actual status of the charger plug. This speaker sounds great. We've been very happy with the sound quality. The Bluetooth works well. It pairs about as easily as any of Bluetooth speaker. The only qualm I have about it is that it's not obvious how to remove old pairings. We've had friends come over and pair their phone with it. Now when we want to change the audio source to another device, we have to cycle through our friend's phones before we get the device we're really interested in. I think the number of paired devices is limited to five though, so it's not really that big of an inconvenience. We leave this speaker plugged in on our kitchen counter with my old iPod Touch. We use the iPod as a dedicated Pandora streamer because connecting and disconnecting a Bluetooth speaker to our phones is a little annoying. We don't use the provided Bose USB adapter (because we needed two USB outputs to charge both the Bose speaker and my iPod Touch), so maybe that's why we have that slight issue with the charger sound notifications. I'm going to give this speaker the benefit of the doubt and assume the non-Bose adapter is to blame. In that case, I give this speaker a rating of 5 out of 5. If you can spare the cash and want great sound quality, buy this speaker.